As a homeowner, you need clear information about the options that are available to reduce flood damage to your home and straightforward guidance on selecting the option that is best for you. Quite often this is a difficult task. First, you need to know what damage-reduction methods are available, the degree to which they work, how much they cost and whether they meet your needs. Retrofitting means making changes to an existing building to protect it from flooding or other hazards such as high winds and earthquakes. Elevation is raising your home so that the lowest floor is above the flood level. This is the most common way to avoid flood damage. Wet floodproofing makes uninhabited parts of your home resistant to flood damage when water is allowed to enter during flooding. Relocation means moving your home to higher ground where the exposure to flooding is eliminated altogether. Dry floodproofing is sealing your home to prevent flood waters from entering. Levee and floodwall protection means constructing barriers to prevent flood waters from entering your home. Demolition means razing your home and rebuilding properly on the same property or buying a home elsewhere. 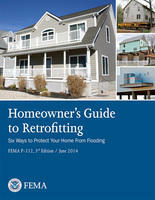 FEMA P-312, Homeowner’s Guide to Retrofitting: Six Ways To Protect Your Home From Flooding, provides information that will help you decide whether your house is a candidate for retrofitting. If you need additional assistance, contact us. This entry was posted in Community, Disaster Response Services, Safety. Bookmark the permalink.